Abhayrab (Rabies Vaccine) can be a life saving medicine. Only the rabies vaccine can protect the exposed person from the virus and safe their life. 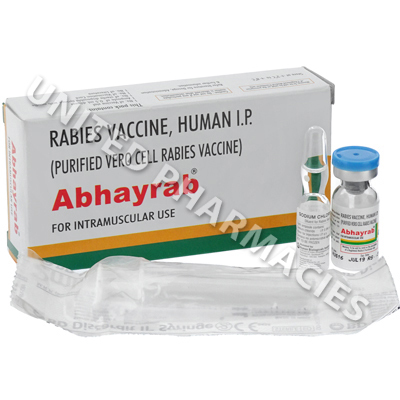 Abhayrab (Rabies Vaccine) - 1 Vial Please note: This product should be kept refrigerated. Abhayrab (Rabies Vaccine) can be a life saving medicine. Only the rabies vaccine can protect the exposed person from the virus and safe their life. The vaccination may potentially cause side effects, however all people bitten by an affected animal must be vaccinated, irrespective of their gender and age. Rabies is a very dangerous virus-related disease. Humans are infected through the bite of an affected animal. The virus spreads through the skin to the nervous system and causes a lethal effect - inflammation of the brain (encephalitis). Both domestic and wild animals can be the carriers of the virus. The most common sources of infection are dogs. Currently, vaccination is the only way to prevent the disease after the contact with an affected animal. The last injection is administered on the 90th day after the bite. This rabies vaccination schedule allows for the most durable immunity against the disease. Another injection on the 7th day. Subsequently, one injection of the vaccine is administered every three years. The most dangerous consequence of the rabies vaccine administration is anaphylaxis, an immediate allergic reaction that can lead to death. Intolerance of the vaccine components.